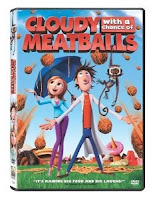 Amazon has the Cloudy with a Chance of Meatballs DVD for $4.99! It is originally priced at $9.99. That's a 50% savings! Plus it is eligible for FREE shipping on orders over $25. Cloudy with a Chance of Meatballs tells the story of an eccentric wannabe scientist, Flint Lockwood. His latest contraption is a miraculous device designed to solve the world hunger crisis. But when Flint bites off more than he can chew, he sets in motion a global disaster of epic proportions. Based on the #1 best-selling book by Judi and Ron Barret.